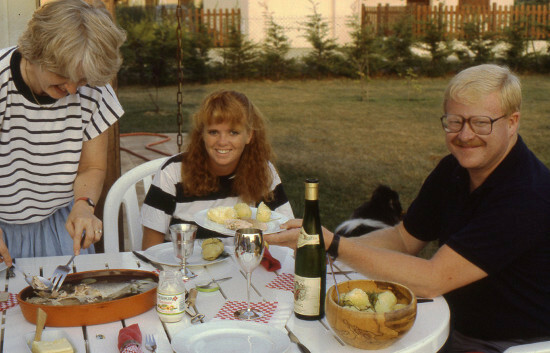 At the beginning of the summer of 1986 John’s parents invited us to join them in Sachseln in Switzerland. Sister Marjie and Neall and Tucker were there too and it was a fabulous treat for all of us. 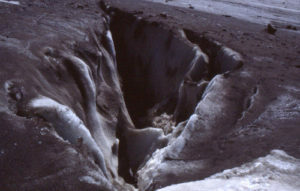 Crevasse in the glacier which, very understandably, turned us away from strolling across it. The crevasses in this glacier reminded me very much of those in the Kebnekajse huge glacier in my early youth, 1947. You don’t just walk across cracks like those. In 1947, however, there was a small group of us and we had a guide who held out his hand to steady us as we jumped across. How my stepfather Arne made it is a mystery to me. He was just 40 though, but I do remember how exhausted he was on the way down actually leaning on the guide. There were quite a few of those pretty wide cracks at the time. I have no idea what this glacier is like today, after global warming has melted a lot of the piled up and thoroughly frozen snow on the top of the mountain. Kebnekajse was 2123 m. high at the time and today, it has shrunk to 2097 meters. Soon the north peak will be higher than the south peak. This incredibly busy summer of 1986 there was also the BIG party in Giessen, north of Frankfurt in Germany at the place of Fritz and Renate Lange, our German friends. They celebrated 25th and 50th anniversaries for just about everything, birthdays and graduation year from pharmacy school, among other things. I had a new dress and I was also wearing high heels and dancing for all I was worth. 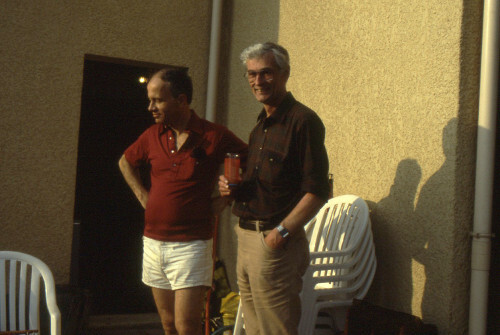 That was, with one little exception in Berlin a few years later at one of John’s international meetings. But at Fritz and Rebnate’s party that was real dancing. The silly Swiss man we knew from Brand, together with our great friend Edi, was the one who made me dance the most. It was fun. Benny and Babette are investigating the newcomer to our menagerie. Our house in Genas has now so much become part of our lives that we could barely imagine living anywhere else. 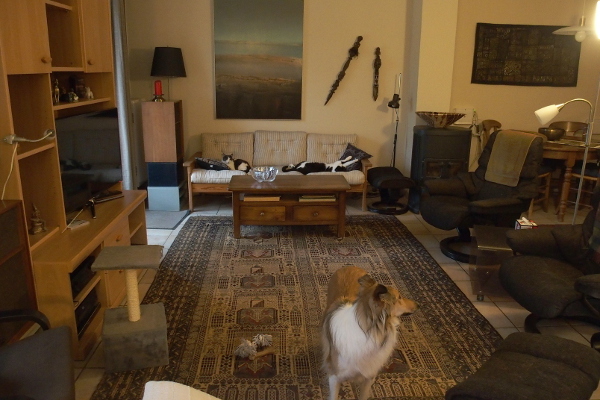 Our three animals, at this time, a (type) collie dog, Katia, and two cats, brother and sister, Benny and Babette, are totally happy in this house and in the yard. Both house and yard have been updated and greatly improved on over the more than 30 years we have now lived here. 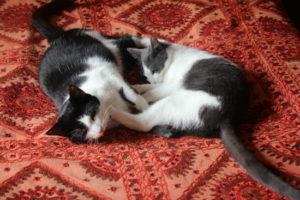 In fact, they are so happy with us that it hurts to leave them at a “pension” when we go on vacation. It hurts, but at least we have a very good and safe pension where they are safe and well taken care of. Katia is let out and played with every day, even though I am not sure how well she plays with the young people at the pension. They are willing, but maybe Katia is not. I doubt t if you will ever see animals happier than our three treasures. Each one is more lovable than the other, and it’s impossible to have a favorite. There remains the fact though that Benny is special because of what happened to him in 1914, as we came back from two weeks in Iceland. Our cats were at a pension where they did not have double doors to the cages. The lady,, a former nurse, who generally took care of the cats was in a wheelchair because of a complicated leg fracture, and her daughter had to take over. The daughter was obviously quite careless and Benny escaped through the single door of the ‘chatterie’. 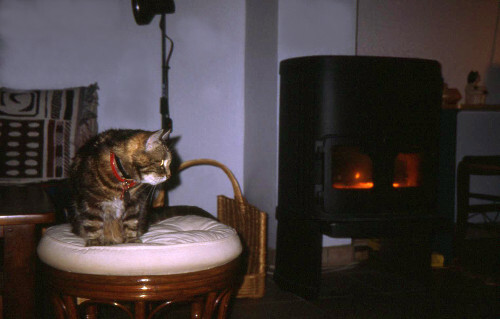 He could not possibly find his way back here where he wanted to be, since we had taken the cats by car to this house in Bron, right outside Lyon, and he could not have an idea of where home was. To make a long story short, he was gone for 47 days. 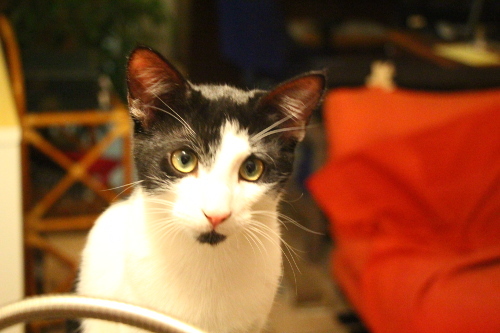 We had put up posters all over Bron with a picture of Benny and promise of reward. We got to know a very nice lady who had clearly seen Benny close to her apartment building and later in a nearby huge park, a joggers’ paradise. 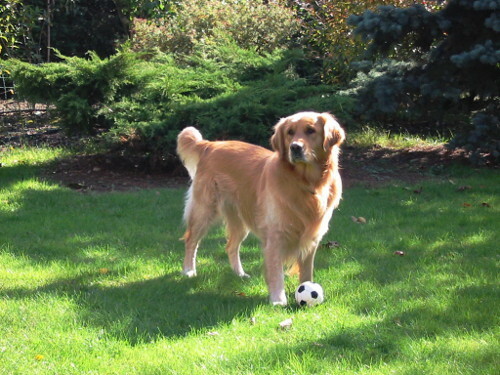 We walked with her through the park one day, but there was no sign of Benny. 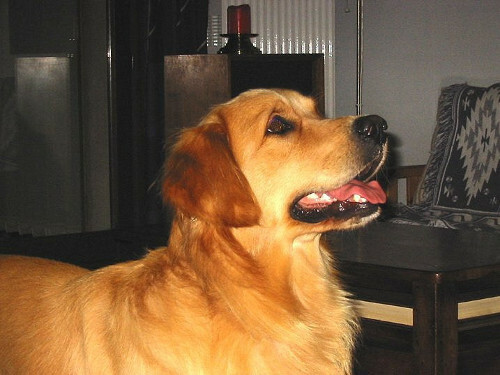 We got calls from people who had visibly seen our Benny close to a hardware store, Leroy Merlin in a huge shopping center. John went there (I had gotten sick in the meantime with a nasty infection. 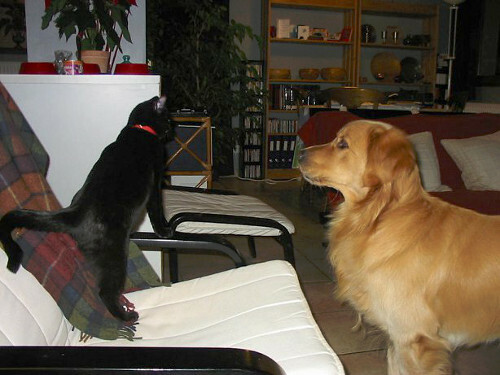 ), but he did not see Benny. One day, as we were having lunch, the telephone rang. 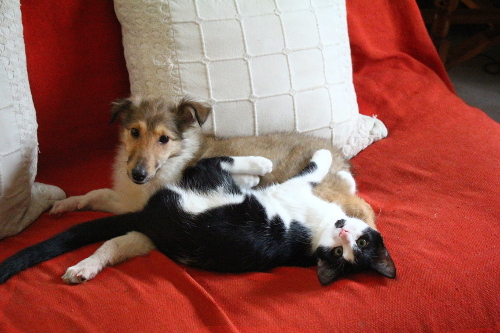 It was our vet who said that she had just been shopping at Leroy Merlin and she had by sheer coincidence seen Benny? 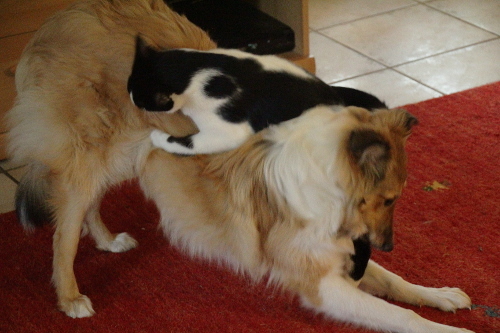 She called him, and after a couple of failed attempts, she managed to pick him up. She was pretty badly scratched, but no infection fortunately. She said I am holding him in my arms. We put down our knives and forks, got into the car and hurried to her ‘cabinet‘, also in Bron. 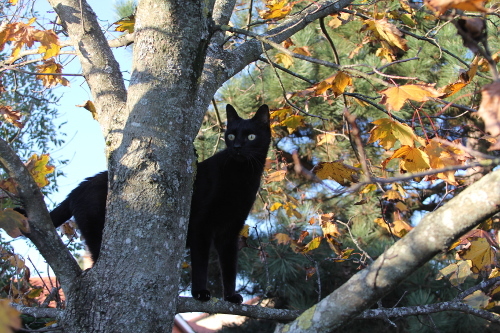 Benny back home in his natural habitat, – in November 2014 . Our lives have mended ever since. It was absolutely unbelievable. 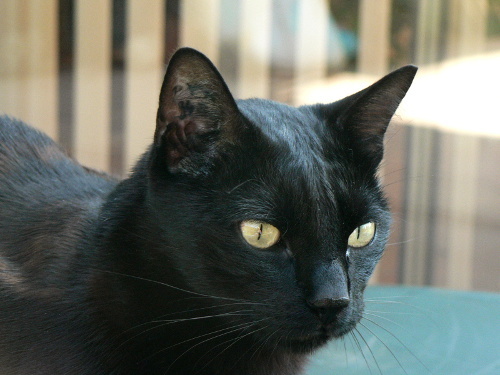 Here was our beloved Benny, just a bit less well-fed, but seemingly unharmed. 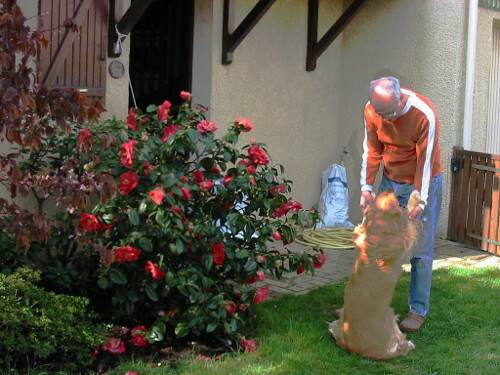 The next day we brought our wonderful vet ten long-stemmed magnificent roses. Of course she said, as the French do “‘Il ne fallait pas“, but of course we would actually like to give her even more, but we couldn’t think of what that might be. This woman, Mme Cara, has now become a very dear friend in a way and we will never ever forget what she did to make our lives complete again. Both Katia and Babette had clearly been wondering what had become of Benny, and they were all happy to get back their brother and playmate. All three are very much attached to one another. 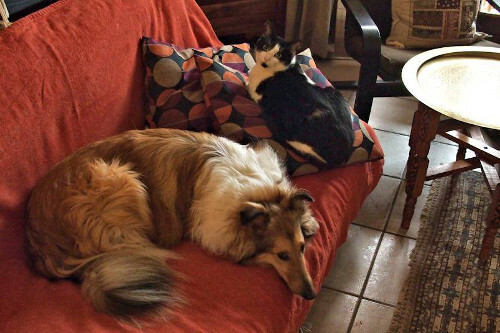 Babette’s standard, when she comes in from the outdoors is to go by Katia’s sofa (a Japanese futon) and rub up against her friend. Yes, Katia has her own sofa. It just so happened. She first had a dog bed, but one day she probably felt she was now grown-up and she moved over to the futon. I put a cover over it to keep her from dirtying it too much and the futon soon got to be her ‘home’. Play and fun on the Indian bedspread upstairs in fall 2014. Our first dog in France, Puppy, German shepherd, much written about in the La Fontaine chapters, died in the late summer in his ‘pension‘ while we were in Brand, Austria. 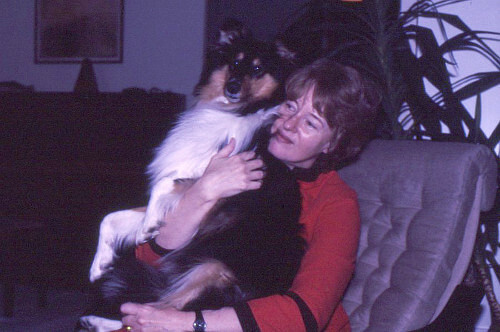 Oh tears when we got back home — Puppy will always be very special to me. 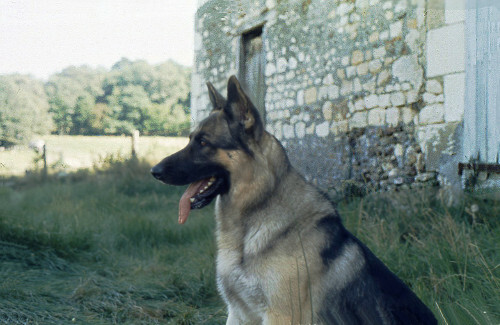 He was my dog. 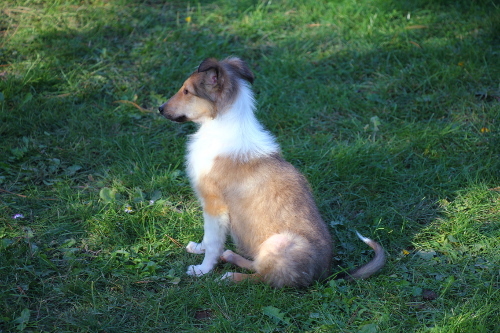 Our next dog was beautiful Babish, (she came with a name tag to her.) our little collie lady, always so elegant. ‘bien coiffée’, as a little girl living not far from our house said when I was walking Babish one early evening. 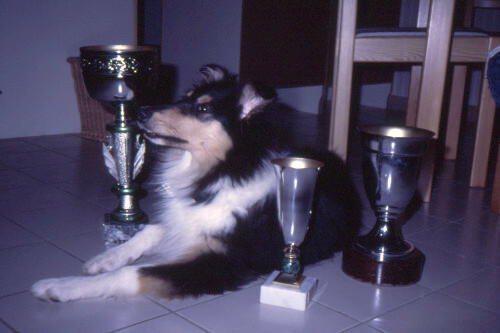 She won trophies in two shows, and the second time was the funniest. 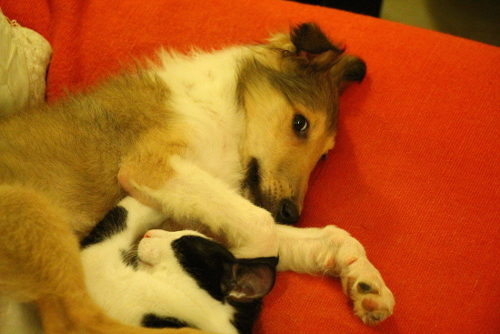 When she got into the ring for all collies, tri-colors, and bi-colors males and females, the judge asked me as soon as I showed up with Babish: “What did I say about her this morning?” (for the female tricolors only) — “That she didn’t perform well”, I said. Without another word, she looked at Babish’s number and read it out over the loudspeakers — 973 (or whatever the number was). I had to do a double-think. Had my dog, just like that, won the big price for the whole show? The funny thing was that the judge didn’t seem to even look at the other dogs. Babish won ‘hands down’. She was obviously the clear champion at the show. During the Babish era I was still working at ESCILand then at INSA de Lyon, where I had my own computer workroom. It started out very well, but after a few years all due to a conspiracy between a hydra of a woman named Veronica who was supported by the Directeur des Humanités, André. I have never known a more ruthlessly ambitious woman in my life. Everybody who wasn’t dancing to her tune had to be blacklisted and finally made to leave. Little strokes of intrigue here and there added to her power. And she apparently managed to get supporters, some just because they thought they might climb up via her back, as I see it. She was hated and feared. But somehow lots of people did not see how despicable and scheming she was. How do that kind of people get their power? I would say they grab it. However, that is now water under the bridge. Evil people exist and that’s that. But to the point. All those years I was working at ESCILand and then INSA we had to find a solution for Babish. There was a space behind John’s garage, which we arranger so it could be locked from the garage and the door out to the yard left open. The fun thing here is that it got to be called Babish’s room, that is what it still is. So, if it ever rained cats and dogs when we were at work, she could take refuge in “Babish’s room”. Things have changed on either side of “her room” during our latest construction in 1917, but “her room” is pretty much intact. Many friends have passed through our house in its various stages — forever changing, it seems. I am just sorry that John’s parents never got to see the enormous improvement our addition in 1994 made to the entire house. After we first had our veranda built in 1987 — my sister Gun’s idea, in fact, who was our very first guest) the living room actually got to be darker yet. Our very first friends coming for a visit to our new home. 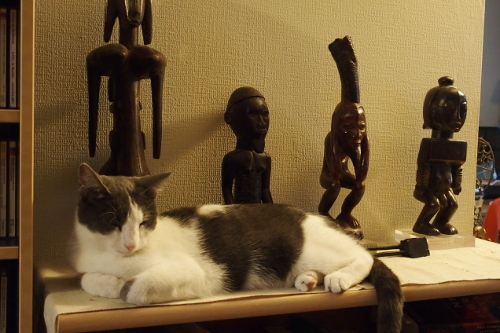 Not one thing in this picture is still around, except, Tillma, Kayser’s painting and my precious old Wharfedale speakers. Where is Puppy? Our very first friends to come and see us here were my colleague from Ecole Centrale, Ann Wellington-Marguet and family. They had moved from Grenoble to New Jersey, and they were bringing up their two suns, Stephan and Philippe to be bilingual. 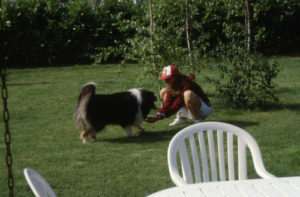 I remember well that Puppy was still with us when Annie and Louis-Henri with sons were here in 1986. Little Philippe was afraid of him and kept saying “Maman, j’ai peur” I can still hear the American r sound when Philippe said ‘peur’ in French. Dear Annie, and we missed her and husband Louis-Philppe this summer, even though they spent six months in France. (2019 now) They live in New Jersey where I visited with them in 1988 when John had meetings at Brookhaven National Laboratory on Long Island. They brought up their family in the U.S. and they all seem to be pleased to go on living in the United States, in spite of the abysmal political situation. I have had health problems for quite some time and it was just never the moment to get together with old friends, be they ever so dear to me. 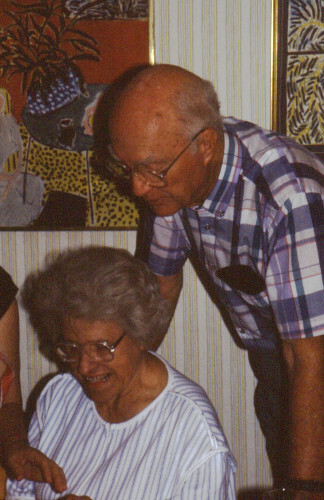 Our oldest friends, or definitely John’s oldest friends, the Mostellers, were here in 1988. 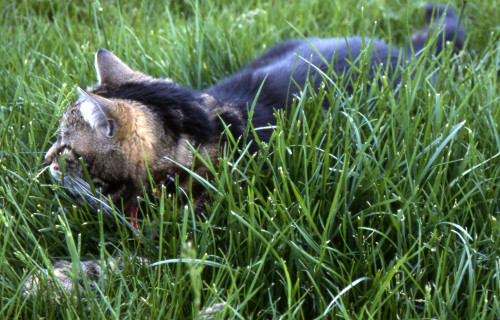 There is a picture I love of young yuppie Maggie and our wonderful Lulu who lived to be almost 21 years old. 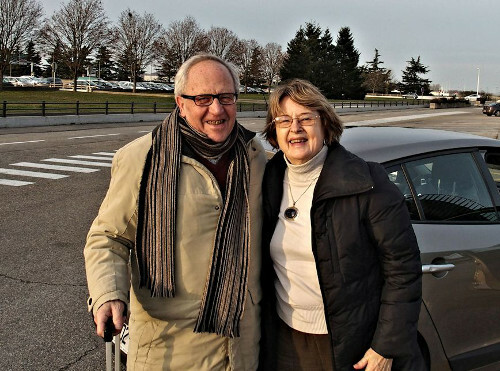 Jim and Sandy came back in 2014, after Jim had gone through his first horrible cancer operations. 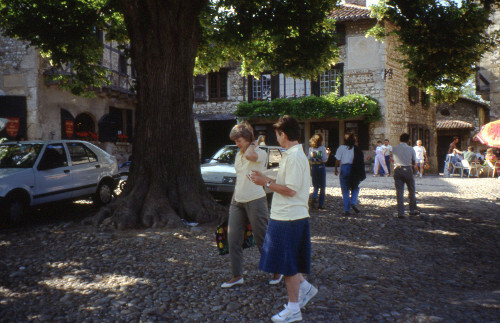 This first visit in 1988, after Maggie took a solo trip in their rented VW Golf to the Côte d’Azur (the Riviera) we all went on to Brand via Switzerland, where we visited a few places that were new to John and also me. The Mostellers are just one group of friends and family that we introduced to the Königer family, our hosts and friends in Brand. We were all having a good time, going on various hikes, and I will never forget how Maggie, a little speck of red in the far distance, was running down far ahead of us on the way down from the pretty tiring walk to the Sarotla Hütte. Tiring? Not for Maggie. 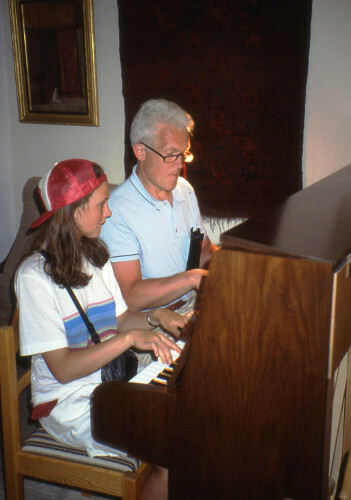 In 1990 Britt and Ingvar with their youngest daughter, Lotta, came to see us. Lotta was in her upper teens. We visited all over the region with these dear old friends — Vieux Lyon obviously, the medieval walled city of Pérouge, the vineyards of le Beaujolais and more of the uppermost seaworthy spots in this area. The Roman amphitheatres of course up on the hill of la Fourvière. I remember that the stage was set for an opera when we were there with Britt and Ingvar. Britt commented on the fact that they actually do productions there today again. A piano duo — John and Babish. 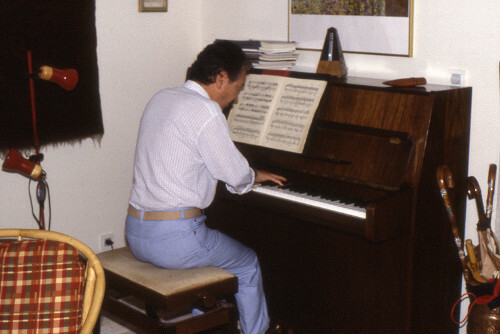 John bought a piano a few years before we left Paris for Genas. He made good progress in Paris where he had a teacher, but from Genas on, his piano playing got set on the back burner, and the final coup de grâce was when he started having pains in his hands. 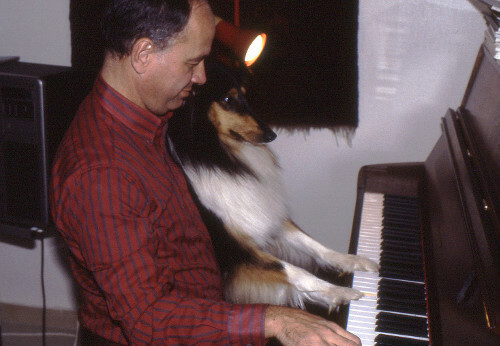 We managed finally to sell the piano, but at a price that was far too low. It was a superb piano that our Parisian pianist friend Jean-François had chosen. I remember well how, around closing time, Jean-François was playing to an audience of the entire personnel in the store. We finally let them close the store, however. The year 1986 when we moved to Genas got to be an incredibly busy year, mostly as far as our own traveling goes, from Paris to Genas, to Austria, to Germany, back to Genas, to Switzerland, and back to get installed in our new house which was at this time pretty much a ‘chantier‘ (indoors construction site). But also there were the several visits already mentioned or not mentioned. 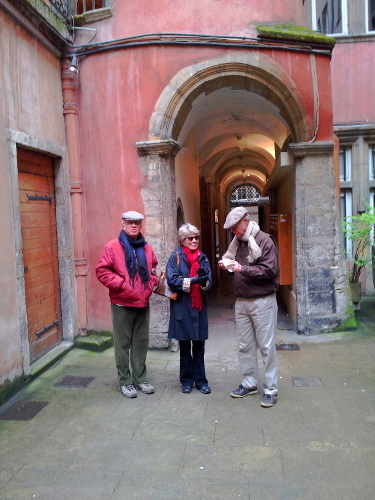 Sister Gun had come before and after Ruth and Jürgen came the visit by the Marguet family. 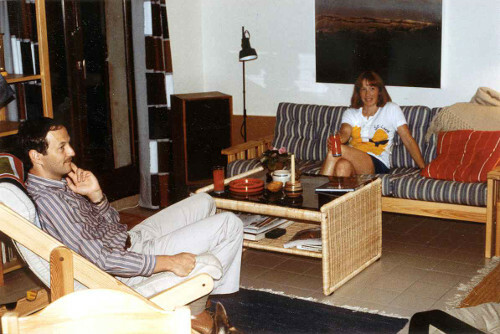 1986 was quite a year for visits to Genas, There was first a visit by dear Paris friends Ruth and Jürgen, one of many visits which have been repeated several times since then. And of course it was the year Babish joined the family. 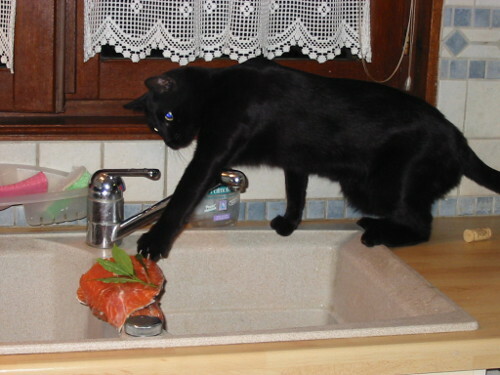 But the moving in before the arrival of Babish was a bit of a nightmare. With the entire kitchen waiting to be installed, as well as the closets upstairs in the bedrooms, it was pretty much chaos. Clothes were piled up in the middle of the bedroom floor. The kitchen came first of course. But once the IKEA closets arrived which now cover one entire wall in our upstairs bedroom, John had his work cut out for him. He would not do that today. 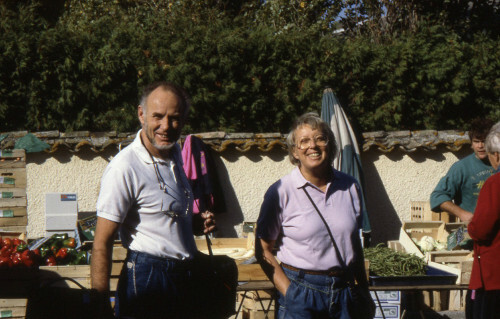 After the Marguet family visited in 1986 there were our American friends, the Mezgers (Wes, physicist and Patsy, haute cuisine chef, graduated from the haute cuisine school in Paris.) with sons Mark and Karl from Nijmegen, Holland. 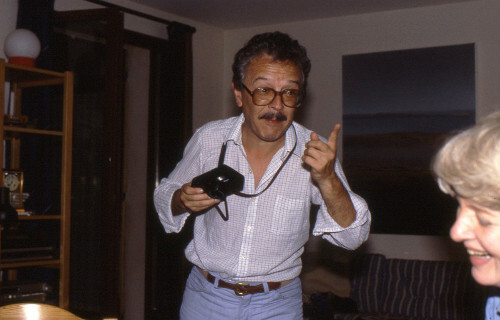 Roberto came to see us twice in Genas, once with adorable Marta and once by himself. Later on, in 1988 he arrived, that time with Marta, his wonderful woman and a psychotherapist from Buenos Aires. We loved her and of course we did the usual rounds of ‘special’-places. I don’t quite know how Marta and I managed to have a conversation when Roberto was not around, but we did. Mainly she spoke Spanish and I spoke French. I had some Spanish when I studies Romance languages at the university, but our Peruvian teacher was very dull and I skipped a lot of classes. I also skipped the second year which was not obligatory. I did very well in the final exam anyway. We had to read three books, so I did learn some. They were followed by John’s parents and nephew Tucker who arrived from the Netherlands where he had visited with a friend. Next came the very dear old friends, the Mostellers from San Diego with daughter Maggie. 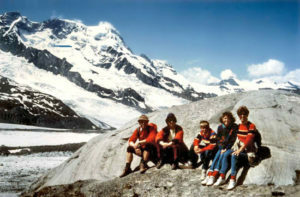 We traveled quite a bit with them, through Switzerland, visiting a lot, on our way to Brand and Haus Kella Egg in Brandnertal, the Austrian Alps. Music at breakfast. Ondine, about 4, is playing the violin for us and Ariane, about, 2, is busy with something else. 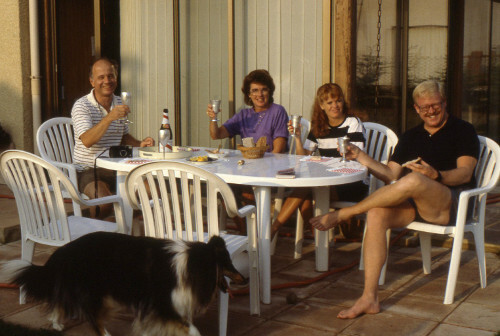 This is in 1987, but the verandah had been installed at least. 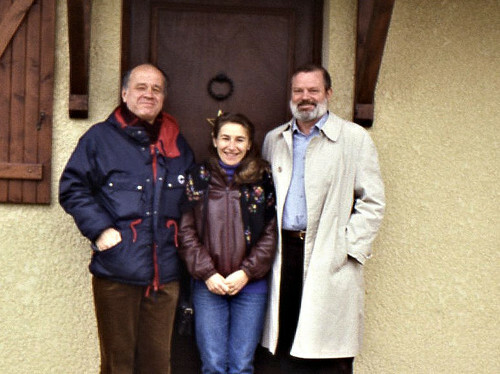 In the early winter 1987 the Génat family came to spend a couple of days with us on their way to skiing in the French Alps. They were among our very earliest friends to visit us. 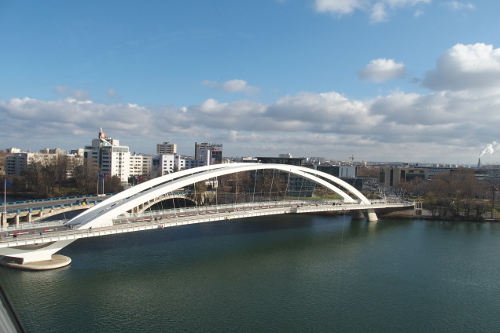 We knew them very well in Paris and we have also been back at their two-grand-piano apartment in Boulogne Billancourt at least a couple of times. 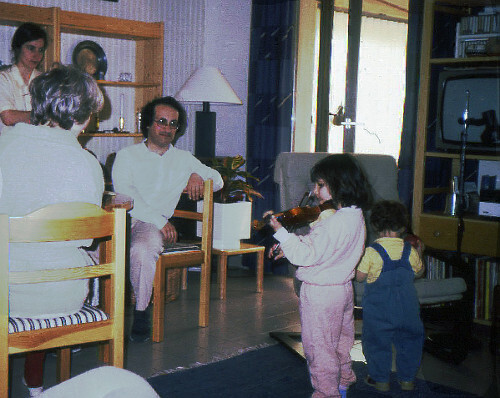 Ondine has stayed with the violin and Ariane is an excellent pianist, like Dad. Around Christmas 1988 Andy and Trudy Davidson came to see us, a very special visit. 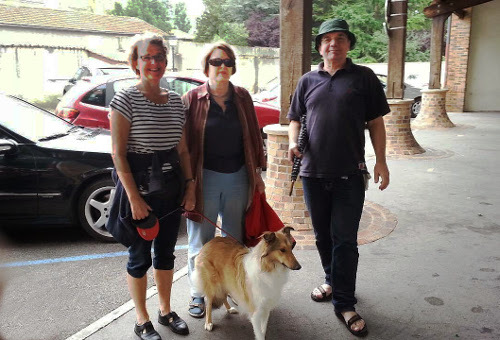 Andy was a very special Ecole Centrale friend from Paris and Trudy his delightful and very young English wife. 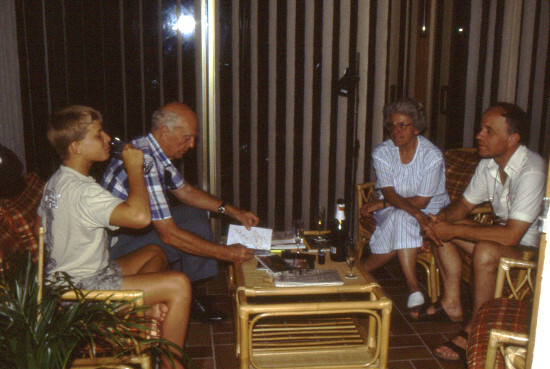 Fritz and Renate Lange from Giessen in Germany came to visit the following year, 1989, and in 1990 there was a wonderful visit from our Stockholm friends, Britt and Ingvar with their youngest daughter, Lotta, as mentioned above. What a wonderful few years. And there had been a time when we thought that our friends wouldn’t bother to come and see us in Lyon, because… well, because it’s not Paris. 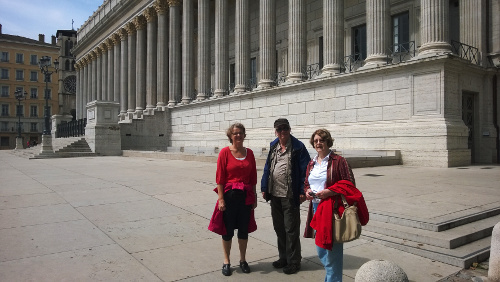 With all our visiting friends we made the standard tours of Vieux Lyon, the Roman amphitheaters up on la Fourvière in the west of Lyon, the medieval walled city of Pérouge, and the vineyards of le Beaujolais, which is well worth a day’s tour with a pleasant lunch to break up the day. The Gallo-Roman museum right next to the Roman amphitheaters on la Fourvière is a treasure, but there is also a wonderful old art museum downtown. And along with all these visits and our own travels there were longish visits to Brand in Vorarlberg Austria, which became our home away from home. 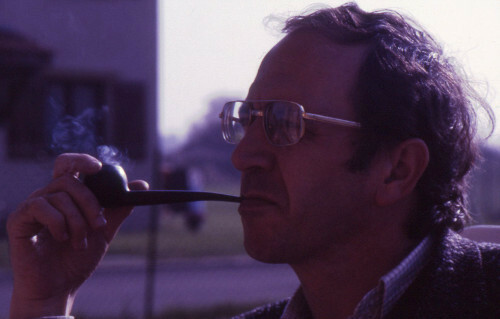 If we go on to the 21st century, there is one more visit, among quite a few, by our dear friend Ted Johnston, once the head of the computing center system group at SLAC, Stanford Linear Accelerator in Palo Alto. Ted was an inveterate biker and was a member of a biking club at home in California. When they traveled to France, Ted would take the opportunity to come and see us, both in Paris and here in Genas. Once his wife Margaret came along and they were both staying with us. John and I both remember Margaret’s funny expression that someone was “happy as a clam”. We also met Margaret again, when we visited with them in Palo Alto. Ted had taken us on a very nice tour of the area south of San Francisco, before we went to their house. 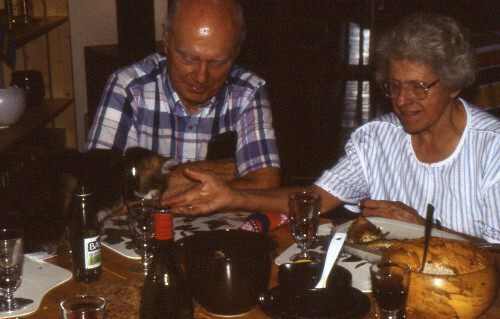 We got to know Margaret again and also their cute little curly-haired dog. A very memorable visit in the fairly recent past (2013) was first John’s sister Marjie and her husband Joe from Daytona Beach, Flrida. They have now moved to a smaller and a beautiful house in Winter Park, very close to Orlando where Marjie and John grew up. We did the traditional visits that we ourselves never get tired of. Here the three of them are in Vieux Lyon at la Tour rose. We also went to le Beaujolais, even though it was only late April and there was nothing much to see. We tasted some wine though, Saint Amour, Juliénas, I remember. Lunch as not in our traditional delightful restaurant, where we like to eat outdoors among the beautiful trees. We had lunch in a restaurant that John remembered that is installed in an old station house. A big clock looks like an old station, and there were probably more souvenirs from times past. And of course we went to the Roman amphitheaters on the hill la Fourvière. One year later was another memorable visit. Our dear old friends Jim (Mossy for John and actually for me too) and Sandy from San Diego. 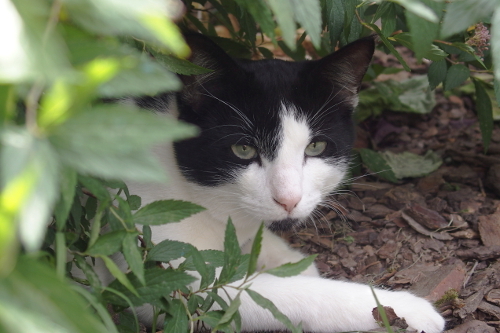 Mossy had gone through a very difficult cancer operation since we last saw him. Naturally iIt had aged him. The same thing again, the Roman amphitheaters and Vieux Lyon. 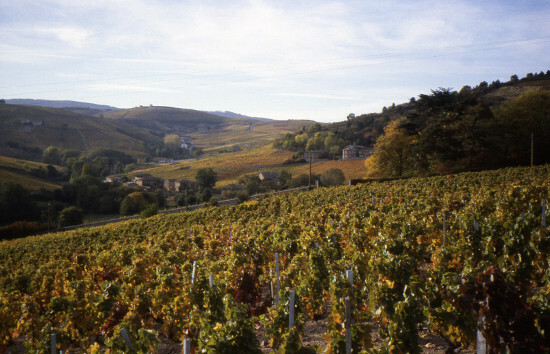 However thay had already seen le Beaujolais in 1988, so we skipped that. 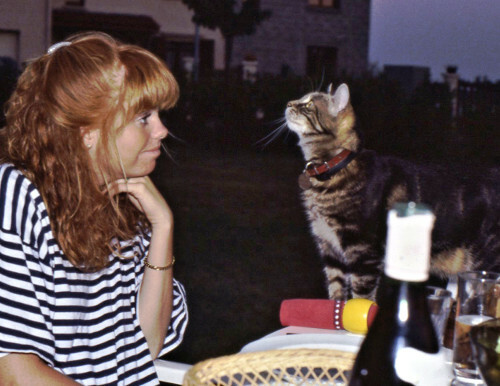 Since Mossy and Sandy knew le Beujolais from their previous visit — in the summer of 1988 — we stayed inside Lyon. 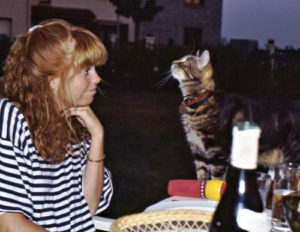 They had also been to Pérouge with Maggie in 1988, so it was more of a visit to us than to Lyon and the Lyonnais region. That time they even came with us to Brand, traveling through Switzerland in a far more touristy way than we did when we traveled to Brand just about every summer. And then, another wonderful visit. 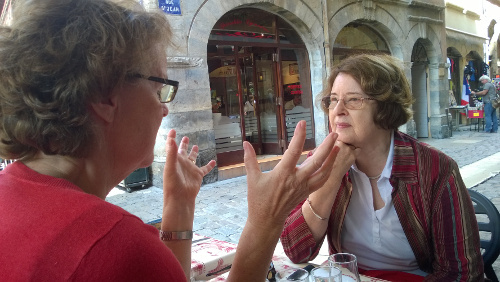 In the summer of 2014 my niece Kajsa had been to a French teaching course in Vichy and Peter had come with her. Kajsa is an English and French teacher, like me. After the course was over, they came to see us, the very first visit from my family of that generation. 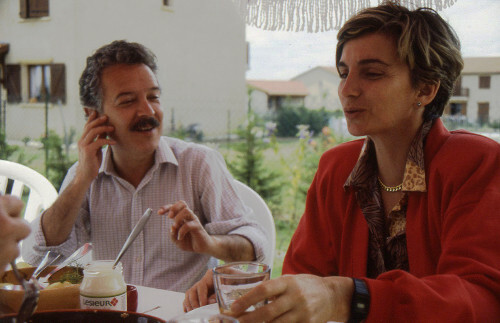 Annie and Louis-Henri were our very first guests, before Ruth and Jürgen, in 1986. Sister Gun was here some time in the early fall, after one of our busiest summers ever. 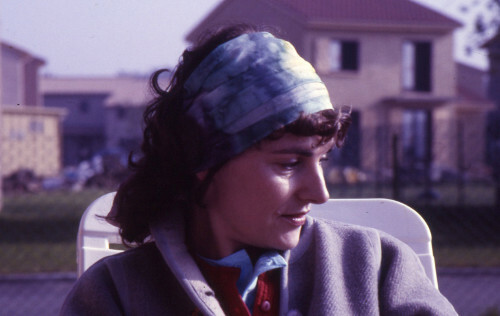 She then suggested having a veranda added to our new house, since we had inherited some money from Arne. We have added to our house twice after that. We now have a bedroom and bath downstairs too, and that is where we live. 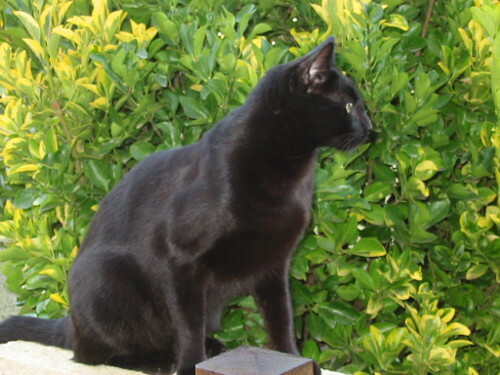 Wonderful when we can open the porte-fenêtre to the outdoors and hear the blackbirds singing. Also, and mainly very handy when you get achy knees and such old-age problems. 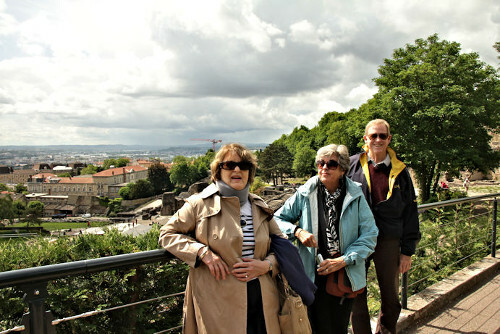 With Kajsa and Peter we went to le Beaujolais, to Vieux Lyon — as well as to modern Lyon of course. 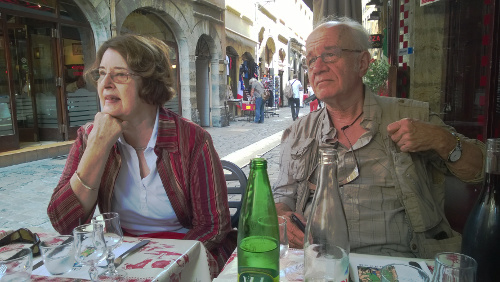 In Vieux Lyon we had lunch at ‘Amphitryon’, the most lyonnais of all the bouchons we have seen an, in a few cases, even tried. The unlucky thing is that, mysteriously, we lost the photos we took during our outings with Kajsa and Peter with John’s camera. Extremely annoying. There was one picture of the two of them out in a vineyard, that I really wish we had. So the following photos were taken by Peter Wahlgren. Our friend Jürgen came to spend a couple of days with us between Christmas and New Years in 2014. We had seen him quite often in Paris, in fact staying at his apartment in le 13ème, but he had not been to Genas for solme time since Clara wnated to spend New Year’s with some special friends in Paris. 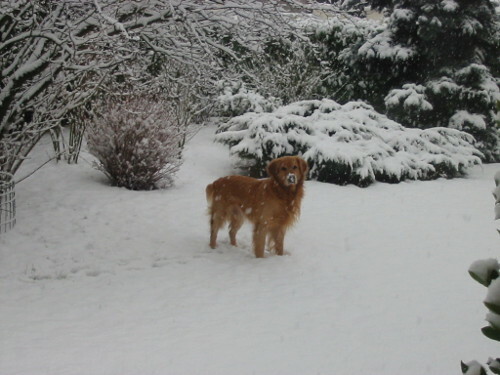 She always spent Christmas with Ruth and her husband Christian in Autrans where they can go sledding when there is snow, which there usually is since it is not far from the Alps. When Jürgen was here there was one thing we could see that he had not seen already and nor had we. 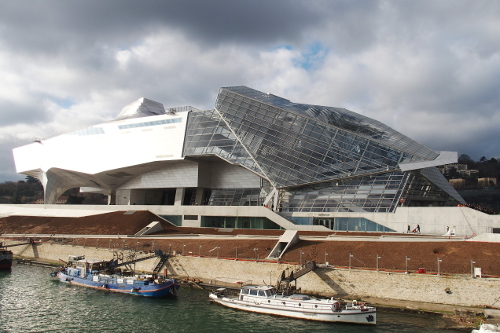 Ut was the brand new Musée des Confluences, which had just opened for the holiday season. Jürgen was pleased, and so were we. 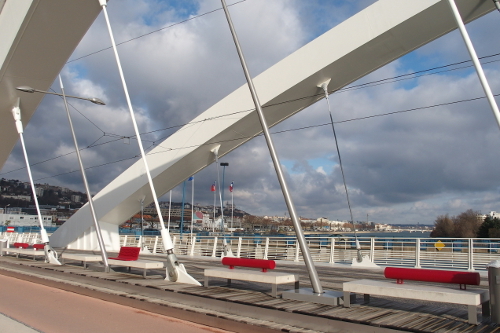 We didn’t think much of the archtecture of the museum, but the bridge is very impressive. 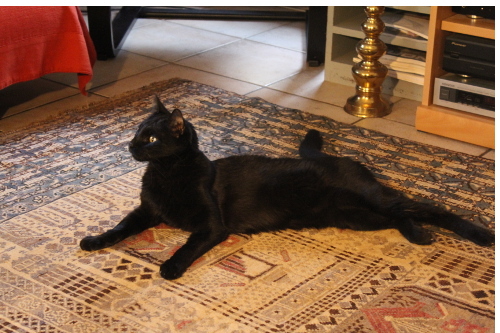 We have now had a pretty long row of wonderful pets since John’s first French cat, Mélisande, started the line in John’s little apartment in la rue des Saints-Pères in le 6e arrondissement. 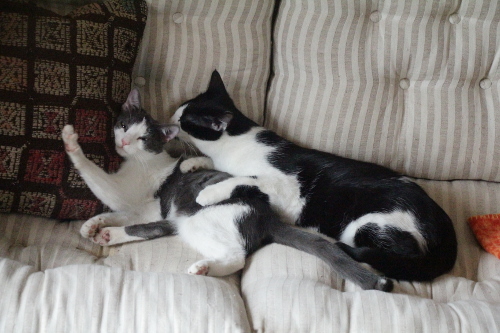 There are oodles of photos to remind us of how adorable they were. 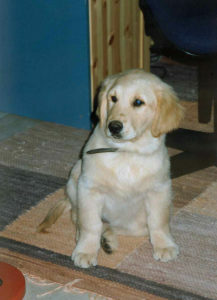 Our wonderful Puppy died at the age of 13 during the summer of 1986 after our first summer in Genas. Sad but normal for a big dog. 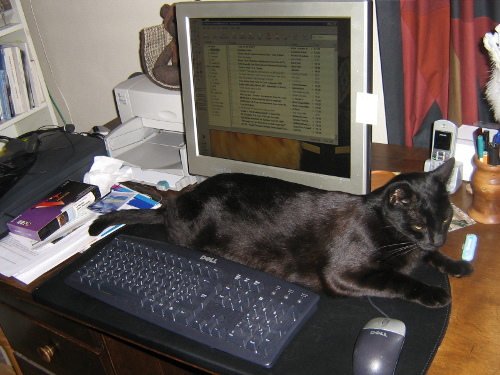 He is very present in my two chapters on La Fontaine (Chapter 27 – La Fontaine – our little old ‘fermette’). 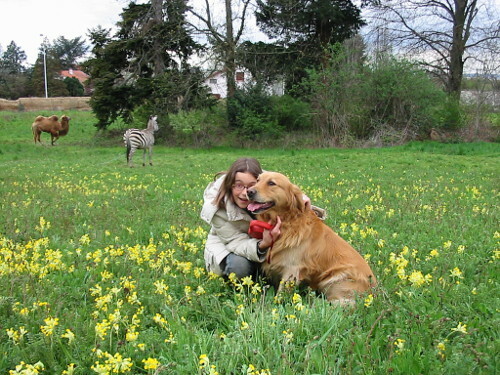 He was far from unhappy in Paris, and I usually found green places where he could run a bit, but of course La Fontaine was a paradise for him. 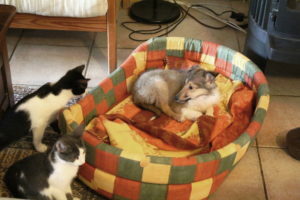 Puppy and Mélisande were our two pets during those years. 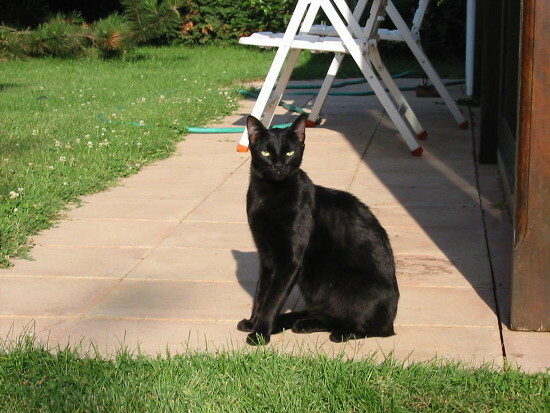 Babish was the prettiest little girl imaginable, obviously also from a pedigree point of view. But before Babish came Lulu who won us over completely when we went to the couple who had taken care of her but who could not keep her. 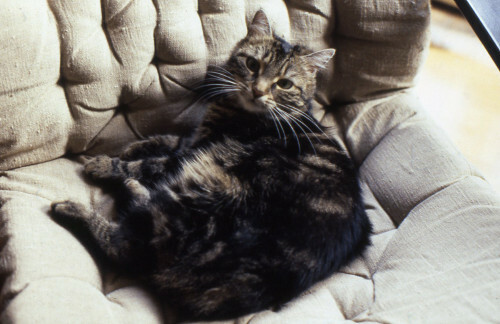 Lulu sat majestically in an armchair that seemed like the master’s chair as we came in. She hopped down and came over to say hello to us.. What better sign can you ask for? She clearly told us she wanted to come with us. I held her in my arms as we walked the short distance to our place. 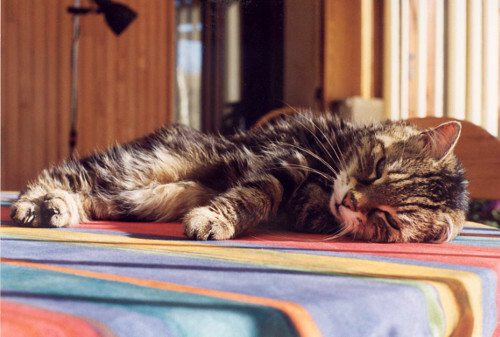 It seemed to us that Lulu was with us for a lifetime, but actually it got to be over twenty years. 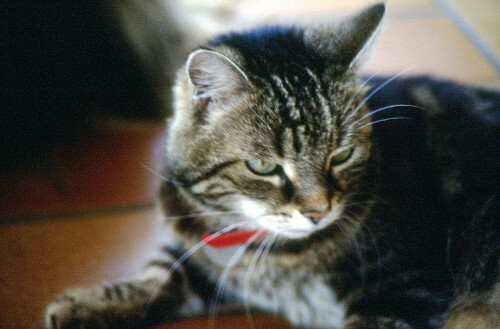 She was a beautiful tabby, like Mélisande? 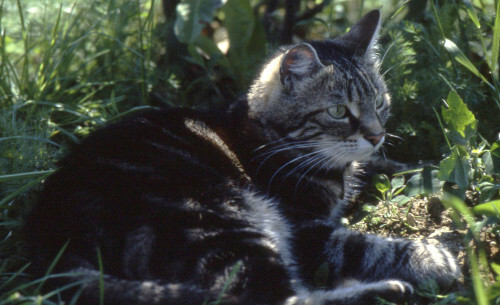 John’s first cat in the United States, Lucia, was also a gorgeous tabby with a big white spot on her chest. 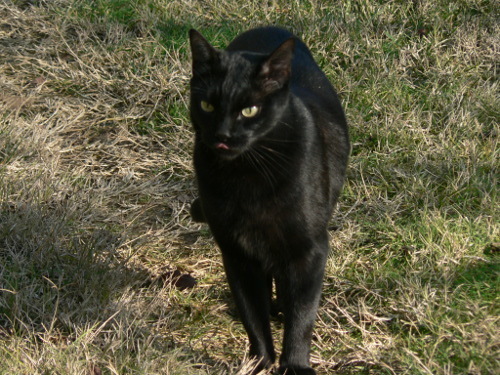 John liked to give names from operas to our animals, but it got to be mainly our cats. 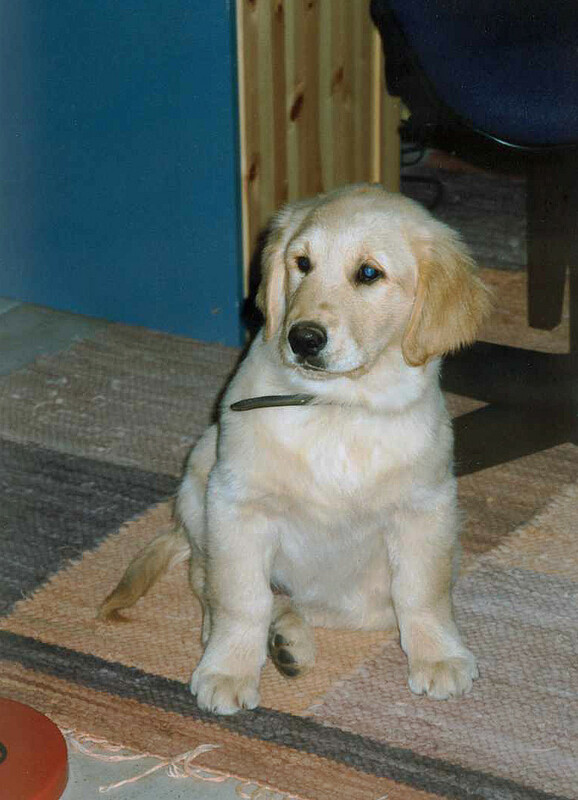 Baby Mackie 1999 who was with us until 2013. Lulu is an opera by Alban Berg. 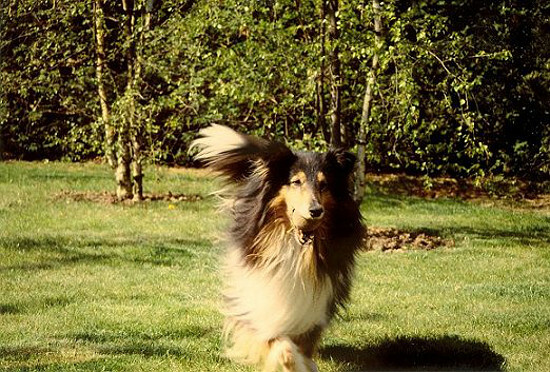 Lulu born 1981, got to be very good friends, not just with Puppy and Babish, but also with Mackie who joined the family in 1999. 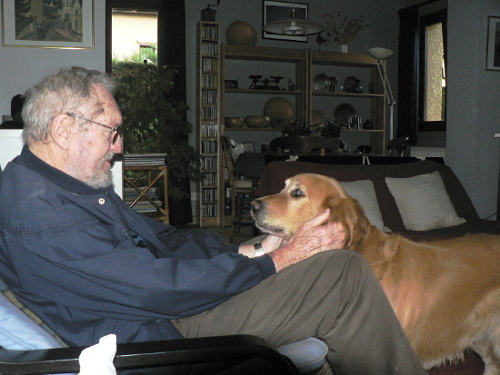 The death of a beloved animal is always very difficult to get over, but John and I are among the people who believe that the best, or really the only, way to get over your grief is to get a new dog or cat. 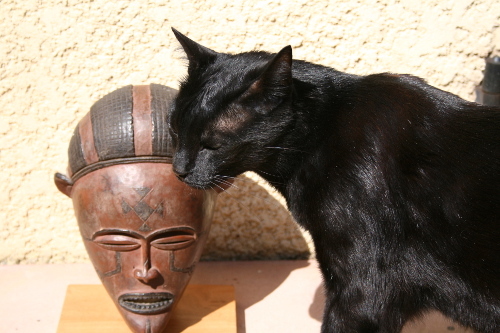 It does not in any way mean that the former pet could ever be replaced. 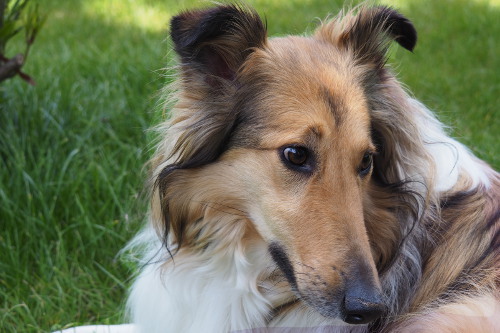 Puppy, Babish and now Mackie will be with us for ever. 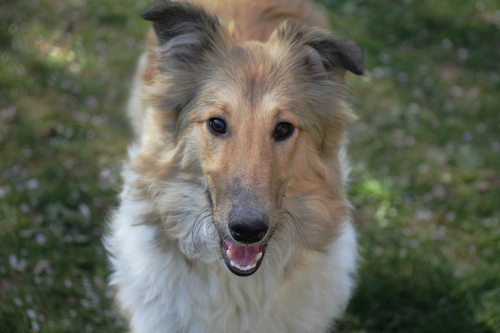 Our Katia, who joined us in 2013, the same year as Benny and Babette is now our favorite dog, simply because she is here. 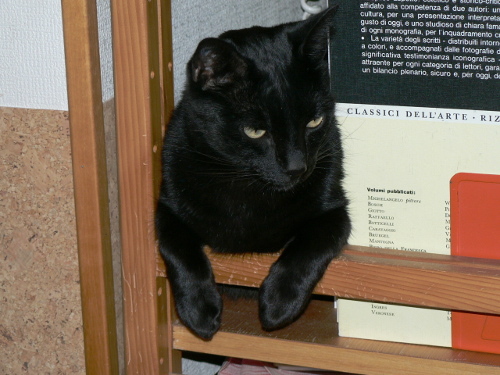 Our ‘magicat’ Figaro, one year old.- John’s prize-winning photo in “Evolution is true”.Figge was indeed a prize-winning cat. Figge. 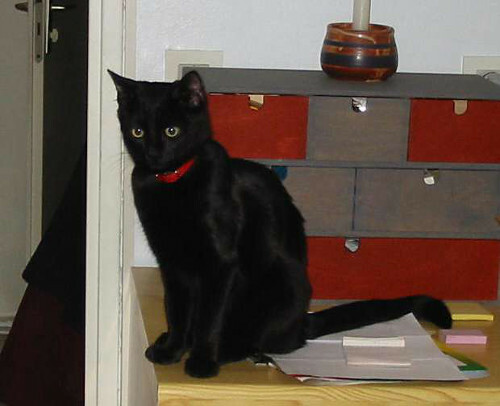 Arne chose the name because Mozart’s Marriage of Figaro’ was his favorite opera. Figge one and Figge two were both the best of friends for our beloved Sappo who would actually guard Figge against other dogs when we were out in the park in front of our apartment building, for a picnic or some such thing. 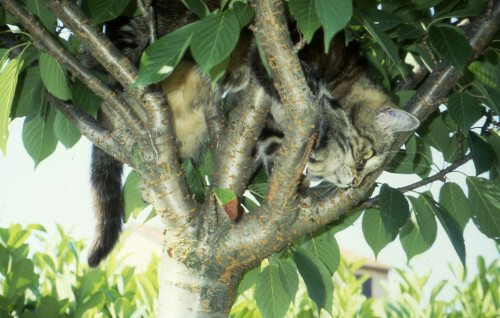 What a wonderful memory, the whole family out in Öresundsparken, White Figge (Vite Figge) up in a tree and Sappo sitting at the foot of the tree making sure that no foreign dog would get at his Figaro. 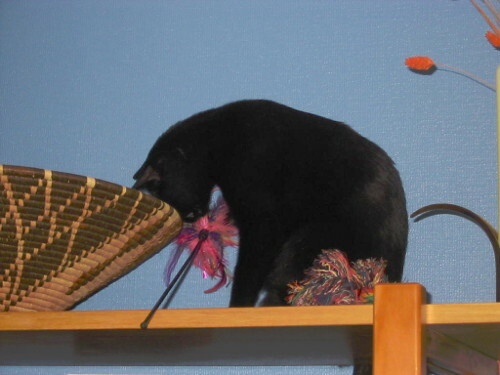 Above is a photo for which John got a prize for best cat photo by the site ‘Evolution is true‘. 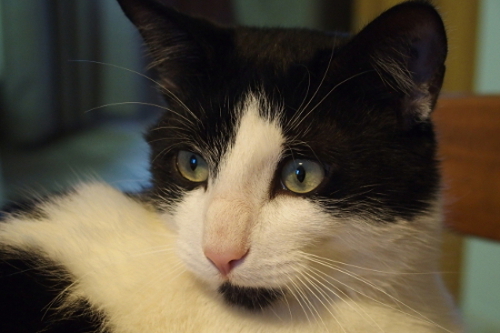 A sculptural and regal king of cats.